Repentance is not a mere word, nor an idea that would come and go, and eventually fade away. Neither is it a blurry state devoid of any significance and emphasis on man’s soul. When man is determined to repent, then he would be rejecting his past, in which he carried out his evil inclinations, twisted perversions, criminal tendencies, lecherous fantasies, and mischievous dispositions. He would look forward for a future unimpeded by his previous severe sins. These sins open a door to Hell. They are of two kinds: internal, such as and small sins such as egotism, self admiration, ill thinking, the belief in a corrupt creed and perverted concepts, in addition to holding a grudge against Muslims and wishing them harm. And external small sins, committed against other individuals, through some gestures, and against the universe as a whole, including God’s creatures which He wanted us to sanctify. A past burdened with sins would create a guilt laden conscience. Present sins motivate believers to act responsibly and decisively by atoning for past sins. Sin is only a lapse, an external factor or a temporary decline which should be redeemed so that it would not stand in the way of man’s future repentance. Some perpetrators, whose sins have managed to penetrate their hearts and minds, would view both, sin and repentance, in the same manner. They would swing back and forth from a state of sin to repentance, and vice versa. Unlike sin, that is considered a contingent external factor, repentance is a necessity, an innate proclivity. Thus, we ought not commit a sin one day and repent afterwards, or repent then commit the same sin again and again. However, not all believers view repentance in such a manner. Some believe that repentance is an act of faith that redresses perversions because faith is based, first and foremost, on rectitude. Repentance springs from the will to change, and the strength to overpower the spirit’s yearnings; thus it is an act of empowering. Finally, repentance is a process of self-renewing and renovating one’s stands that time has wearied out. Repentance requires that all our future plans and projects be set in accordance with God’s will. In acting contrary to God’s demands, we shall be tolled back to our past condition. Hence, we shall refrain from entertaining sinful thoughts and pondering errant acts for the rest of our lives. Wherever man’s soul turns, except towards Allah, it is doomed to sorrow. As we renounce the sins we have perpetrated, God draws us near Him, and He becomes sweeter to us than all the alluring pleasures that we have followed, and He will still draw us away from every temptation that might follow. A repentant man calls upon God: “O God! My mind and heart are restless until they find peace in You. The remainder days of my life shall be a reconsideration of my past sins! I endeavor to draw myself nigh to You through Your invocation For verily, Thou hast ordained for Your bondsmen Your worship and bidden them to supplicate unto You and hast assured them of Your response, Your, exalted be Your grace, have said in Your Holy Book: "And He it is Who accepts repentance from His servants and pardons the evil deeds and He knows what you do" (42:25). 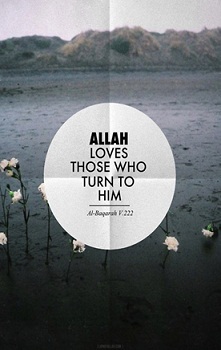 "Surely Allah loves those who turn much (to Him), and He loves those who purify themselves" (2:220). And I pray to accept my apology like You have promised and I entreat You by Your benevolence to draw me nearer to You. You have taught loyalty to Your bondsmen, how can they distrust what You have ordained upon Yourself”. On a personal level, I tend to view repentance as concerning my whole being, with all its entities. My heart shall never deviate from God’s path, neither shall my fearful eye behold what God forbade, nor shall my tongue ever articulate words that, by instigating conflicts, and encouraging lechery and perversions, destroy our spiritual, moral, and social set of values. The issue involves all of our body organs, and the function of each, which could be conducted in a permissible, or an impermissible way. The heart repents perverted emotions, such as the love of the enemies of God. The mind repents skeptic, dull, and infidel thoughts, and the distorted intellectual approach that contradicts the Islamic one. The eye, too, repents an aggressive, or a mocking look. The tongue repents articulating forbidden words. Each and every organ in the human body repents desires, yearnings, and criminal notions. In such a repentance, to which I aspire, my soul transcends and my body conducts itself to a true Islamic behavior. Thus, all our organs will be free from the burden of guilt, vice, and the Divine chastisement; and our soul will rejoice in God’s infinite grace.